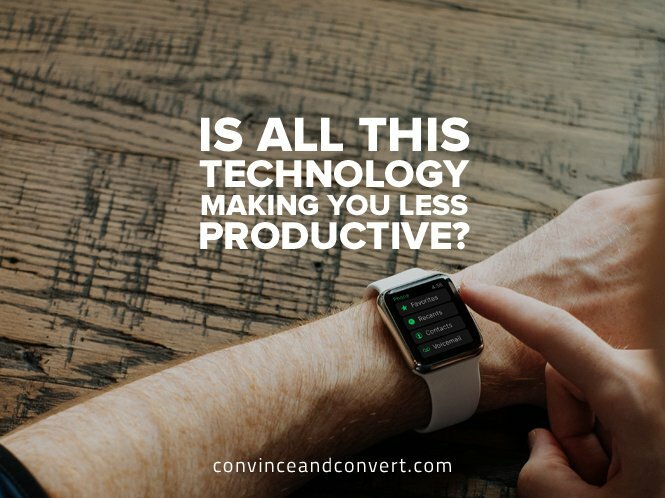 Is All This Technology Making You Less Productive? We are surrounded by technology. Among the small—but mighty—Convince & Convert team alone, we have approximately 57 software licenses, nearly all of them intended to make us faster and more productive on behalf of our sponsors and clients. But maybe all this technology is having the opposite effect? It’s possible that the diaspora of software tools is making us less productive, and perhaps the same is true for you? This is a question I had not pondered until recently. I accepted with near total allegiance the notion that software is inherently a productivity booster not an anchor. 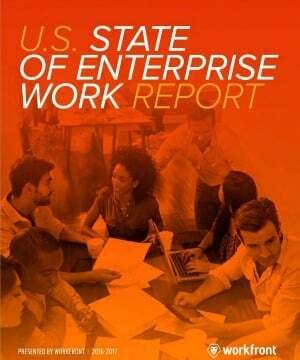 But a new report from Workfront (one of our favorite sponsors) called The U.S. State of Enterprise Work Report got me to rethink my assumptions. Are You Doing Less and Working More? That’s right, just 39% of the average big-company workers time is spent doing their actual job. And although this study didn’t break out results by function, I’d wager handsomely that this is particularly true for content marketers and social marketers, both besieged by new software tools to try to keep pace with changing best practices and hungry competitors. Where does all this wasted time go? Trying to communicate with one another! This, despite the increasingly widespread adoption of chat-based communication tools like Ryver (which I prefer to Slack). This, even though the culture of fewer meetings is allegedly taking hold in most companies. This, even though the notion that “you better have a reason to have a meeting at all” is all the rage in management books. We’ve spent a lot of time adopting software and talking about how to communicate more effectively with our co-workers, and evidently it’s getting worse, not better. Perhaps not surprising is the finding in this study that the most common reason for conflict between teams or departments in a company is “lack of communication” at 36%. It’s Not Your Fault, It’s Their Fault? One of my favorite findings in this study (download the whole thing here, no email required) is that everyone thinks THEY are productive, it’s their co-workers that don’t have their act together. 92% of workers say they are productive. This is, of course, impossible and is colored by proximity bias. We believe those to whom we are closest are more productive because we are more familiar with what they actually do all day. This effect is clear and pronounced in the report, as you can see that each layer of management is viewed as less and less productive! 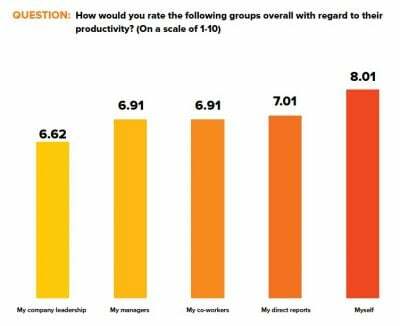 Leadership is viewed as productive at a level of 6.62 on a 10-point scale, with respondents rating themselves 8.01. How Does This Get Fixed? Ain’t this the truth! This is a particular problem for content marketing and social marketers whose work is often comprised of lots of components tasks that must be shifted to and from each day. This issue is why I only write blog posts on planes or weekends. This is really a change management issue and understanding how to squeeze operational bottlenecks out of the day-to-day. Software can help here, especially when it’s a suite focused on productivity and not a piecemeal collection of unrelated log-ins. Workfront seeks to be the leader in that suite approach (hence their research on this topic). A very interesting response, because it seems like many of these respondents think additional human beings and/or smarter human beings has a linear relationship to productivity. I’d argue it does not. In an imperfect process, more people does not enhance that efficiency, but rather increases nodes of inefficiency. You can paper over inefficiencies with labor, but the inefficiency at the core remains. This report includes several more data points about workplace frustrations (and let respondents reply using the Poop Emoji, which may be a market research first! ), it turns out that on the whole, big company workers are satisfied.